Tmall International revealed the imported e-commerce performance in the past Spring Festival, expressing that the sales boosted 20 times and 70% contributed from 90’s. 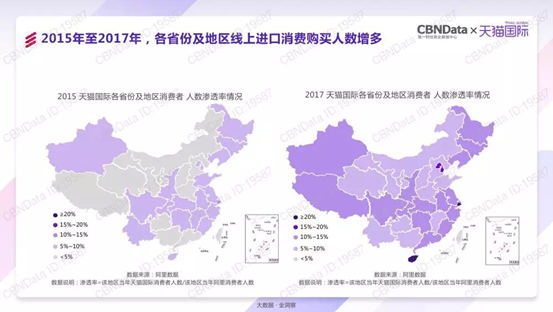 Shanghai, Beijing and Hangzhou have become the top 3 cities of imported consumption, followed by Chengdu and Chongqing during Feb 2 to Feb 22, 2018. Moreover, in addition to Japanese beauty instrument, French perfume, wine, US health products, Japan and South Korea beauty, Europe infant & mom products became hot in market, while import countries expanded to Malaysia, Brazil, Chile, Israel. At the end of 2017, 68 countries and regions with nearly 4,000 categories import of 16,400 brands abroad, entered the China market for the first time. You have the chance in China e-commerce!